Dynamic your speed is signs. See what traffic is doing. A highly visible Yellow led matrix display showing accurate real time traffic speed of any approaching vehicle. A clearly visible display of the drivers speed. This is what most people think of when they imagine a speed indication device. 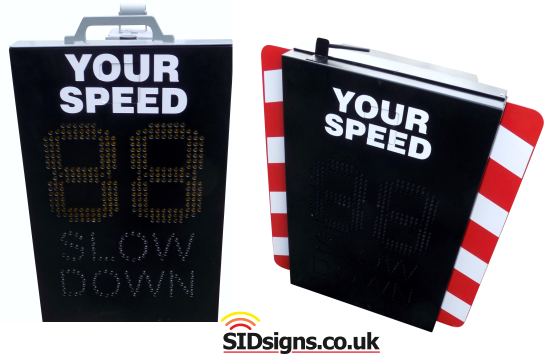 To improve the effectiveness of this type of speed sign we add a SLOW DOWN message made with bright White led's. Independently controlled by an internal software setting this message can be set to turn on when a specific speed limit value has been breached. Control when the dynamic speed matrix turns on, set the Slow Down speed, decide whether to flash the message or leave it constant. These factors can all be determined by you with ease using the built in auto detect USB drive technology. This standard feature means there is no real need to pay more for a wireless connection; it's a simple USB insertion and away you go. If you need data collection than this is an option for all models of speed sign, not just dynamic your speed designs. 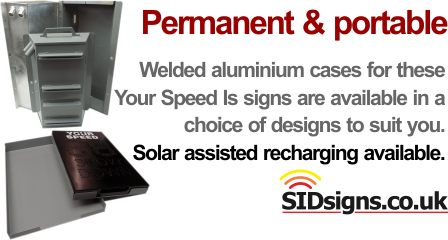 Dynamic your speed is signs are manufactured from aluminium which is carefully cut, folded and TiG welded. Once the bare dynamic speed case is made it's then finished with an oven baked powder coat finish. This approach gives you something which won't rust, something which isn't weakened by UV rays. The actual display face of the YOUR SPEED display is always made from a drilled aluminium panel. This is material is stronger and more vandal proof than clear plastic screens or covers; signs have been hit by shotgun pellets in the past with no ill effects. 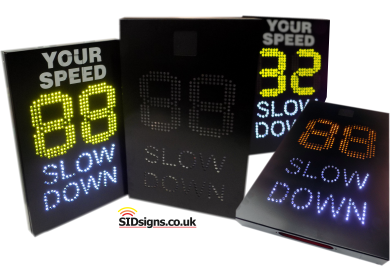 Dynamic speed is signs are available with a range of options. From different power packages through to solar panels and tripod mounting systems. A basic speed is sid can be configured to suit your needs. Data logging is an available option with this type of speed sign. Auto detect USB and software settings are both standard features. If you want to mount a Your Speed Is style sign using standard traffic sign clamps then the cabinet casework is the best choice. Fitted with standard sign channel rails permanently welded to the aluminium cabinet this format allows you to use a familiar system to attach directly to a 76mm or 50mm diameter post. If you want something more versatile, something easy to move and compatible with a variety of different post diameters the new portable format is your best choice. These products deliver exactly what you need; a sturdy device which accurately responds to traffic speed. Made from quality metal alloy throughout you are paying less for a better grade of display system; this is made possible because of the in-house manufacturing process which drives down costs, eliminates sub contractors and their profit margins.